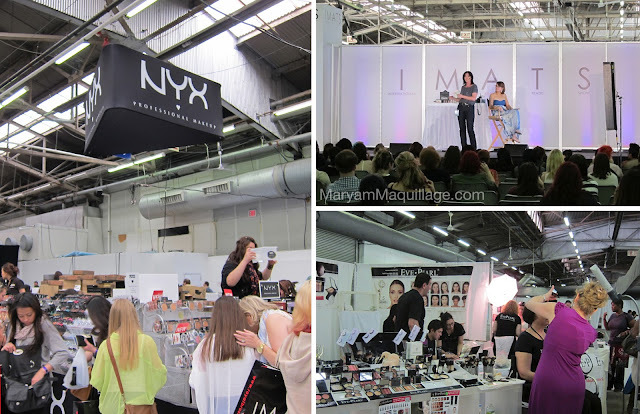 Maryam Maquillage: IMATS NYC 2012! 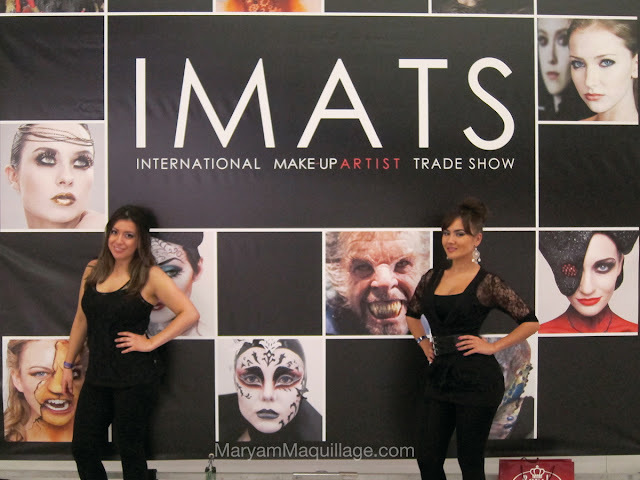 The International Make-up Artist Trade Show (IMATS) happens once a year, in 6 fashion capitals of the world, gathering mua's, vendors, industry celebs & professionals to socialize, network, teach, shop and promote all things makeup. The show is open to the public for two out of the three days of the event where makeup enthusiasts can stock up on exclusive and permanent items at discount prices and also learn tips and tricks from industry insiders. Since I've been beauty blogging for a little over a year now, I figured this was an event I could not possibly miss. Liz and I dabbed into a little bit of everything that the IMATS had to offer: we attended classes (airbrush techniques pictured below), socialized, took pix, and definitely shopped until we almost dropped. Just check out my pix! The NYX booth had some of the most enthusiastic shoppers and longest lines, while the Eve Pearl demonstrations and OCC booth were the most crowded. One of my favorite monsters. She was sooooo cute!!! Taking a quick lunch break with my Lizzie. Our makeup was really cute (and natural compared to some of the attendees), but I totally forgot to take any close-up pix other than this low-quality Instagram... silly me. P. S. Liz got super sprayed at the SunLab booth. She's normally alabaster white and after the spray, she is way darker than me!! I must have taken this pic about 25 times and for the life of me, my new camera was not point-and-shooting... It was probably the most ridiculous moment of my IMATS experience. Even the people behind me were laughing at us lol... sorry for the crap quality, but anyway, just wanted to show that I WAS THERE!!! 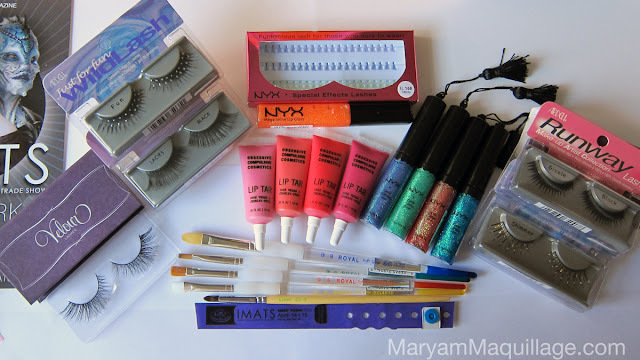 And now, the moment you've been waiting for: my HAUL!!! I was a smart shopper with only one real spurge: mink falsies from Velour. I figured I wasn't a real Russian until I owned a pair of mink lashes! STAY TUNED for reviews & makeup looks!!! You look beautiful! Can't wait to see the looks you create! Velour lashes and OCC?! I missed that too?! Sadness fills my little heart. I'll have to live vicariously through you, so I can't wait to see them in action!! You look beautiful! Check you out with the curves... :-) I love the items you purchased. Can't wait to see your looks with them! Aww you look absolutely amazing. 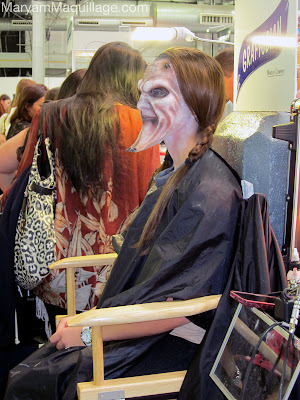 I am so jelly, I wish I could have attended Imats in NY. Looks like you had a blast! Thanks for sharing. You really stand out amongst people, look how freakin gorgeous you are. I'm excited for you, you got those lip tars i've been wanting for so long. Haha, mink lashes for a Russian doll. I just bought some too, can not wait to try them out some more! What do you guys think of them so far? Imani my love, I heart you too :)) I think you're talking about the lip tars right?? I think they're pretty darn nifty lol, I'll have some reviews up soon!!! thank you so much sweetheart <3 omg you're gonna love NY!!! Maryam, you look hot! Love your outfit! Flawless post as always, and that bun is adorable! I knoooowwww tell me about it :((( I couldn't go on Sat, so I settled for Sun, though it did seem a lot less crowded and crazy... next time for sure!!! looks like you had a great time! after working at it last year, i thought i needed a break this year and now im kicking myself! Oh my gosh, you looked amazing and looked like you had an amazing time with lots of goodies to boot! I didn't have the patience necessary for the lines at IMATS Toronto so I only stayed like an hour and then got the hell out of there. Next year I will be better prepared and maybe I can have such a fun post like the one you've put together here. You look beautiful! Seems like you had a lot of fun, I missed this when it came to my city.. next time I wont though!! I see the lip tarts I've been wanting for a bit.. jelly!! Can't wait to read your reviews. You look amazing hun..So sad no IMATS available here in my country if not I would go and grab a bunch of stuff..Can't wait for the review..
hey maryam!!!!!!! looovvveee your outfit!! you looked gorgeous!! 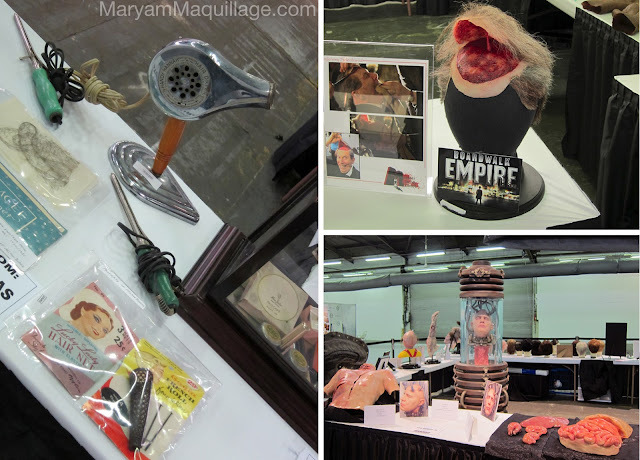 i loved imats LA last year and im hoping to go this year again!! ♥ great post! You are effortlessly glamorous (as always! ), love the ensemble you chose for IMATS! If I go to the LA one, I'm definitely going to need to take a level headed person to restrain me from buying everything! Is the discount really significant at IMATS? And do you have to be a pro to use the discount? thanks sweetheart :)) some brands offered decent discounts, others not so much (the pros get an even bigger discount on top of the set one). I was really surprised that LA Splash (one of my favorite brands for colored mascaras) was selling items at retail prices. I was hoping to score, but I ended up walking away empty handed... I just thought it was really disappointing. I didn't go to the LA IMATS last year because I was REALLY REALLY new at beauty blogging. Now that i'm a bit more EXPERIENCED I really wish I could go (but I probably won't be able to -w- boo law school prep!) LOL Real russian until you have mink lashes. Looks like a great haul! yup, same here... I didn't even know about the IMATS last year lol... OMG best of luck to you with law school!! you're gonna do great!! you got the nicest body! all the right curves in the right places haha <3 wish imats came to canada where i live :( looks so much fun! awww thanks boo :)) they IMATS do come to Canada, to Vancouver and to Toronto!!! You should definitely go!! Girl your body is sick! I wish I had your curves. Outfit was perfect and of course the makeup is flawless. Wish I would have made it on Sunday to meet you. Hopefully you can make it out to IMATS LA??? Oh how fun!! =) wow you have an awesome body Maryam! Hi Maryam! Cool post and you look Fabulous!!! Have a nice day and see you soon! Xoxo V.V. Maryam do you live in ny !!!!! Great photos and awesome haul!!! Looks like you had a great time! You look stunning! 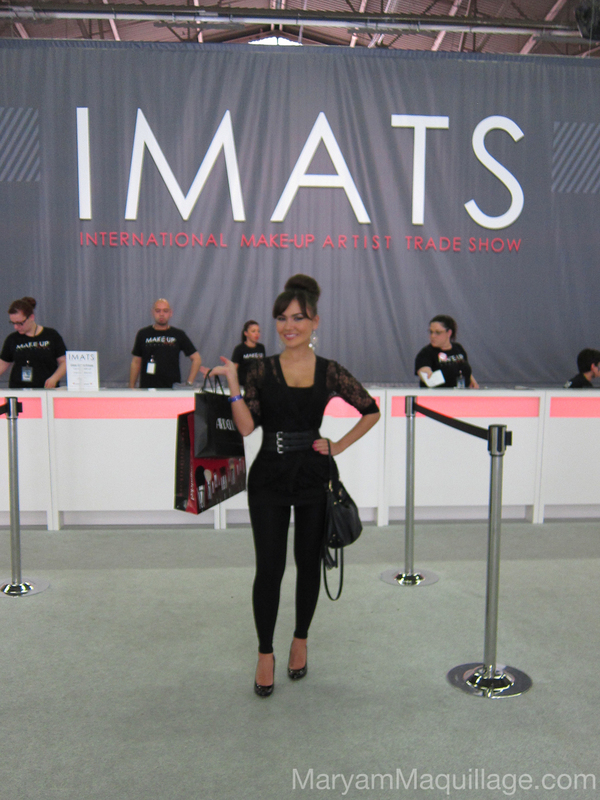 It will be my dream-come-true to attend IMATS.